Christmas doesn't have to be all work for Santa does it? 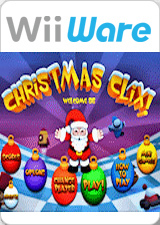 In Christmas Clix, Santa's having some fun and wants you to play along too! You can help Santa decorate the tree by removing the presents and ornaments that he stacks. When you consecutively connect packages without missing a beat, you get extra points. Oh boy, what a treat! Collect as many candy canes as you can because when you collect enough, Santa will add a special star to the game that can greatly help you get through a level or just bring some additional fun! The graph below charts the compatibility with Christmas Clix since Dolphin's 2.0 release, listing revisions only where a compatibility change occurred. This page was last edited on 13 January 2018, at 07:36.